Jim Peterson is almost uniquely qualified to offer perspective on a host of trust issues. CHG: Jim, thanks for doing this interview. You’ve got gray hair, multi-cultural experience, and multi-professional experience—plus being a student of people. What is it that professional services people, especially accountants and lawyers, are really good at? And how does that vary between Europe and the US? JP: Professional advisers are used differently in different countries. In Europe, both accountants and lawyers are more likely to function as close and trusted advisers, to facilitate their clients’ strategies. In America, the lawyers have taken control of commerce – through detailed, bright-line rules so complex as to require their constant interpretation (but which also invite being bent or broken). Where Europeans will do with a five-page agreement, American lawyers will churn out 100 pages (and charge accordingly). Unfortunately, recent years show a convergence of global markets (and liability) toward the American model. CHG: What about the accountants? What should we trust accounting firms to do, and are we reasonable in our expectations of them? Are they agents of trust-certification? Or is that just silly? And—can we trust the accounting firms themselves? JP: The accountants have shown themselves trust-worthy within their own limits – to provide reasonable assurance, within limits of materiality, most of the time. The trouble is, and it is partly their own responsibility for over-selling, the public has come to expect and demand “zero defects” regarding their clients’ performance – which is beyond the accountants’ capability. As a result, infrequent but highly consequential cases of sub-standard performance are serious enough to threaten their survival and the existence of their franchise as it has been structured since the 1930’s. 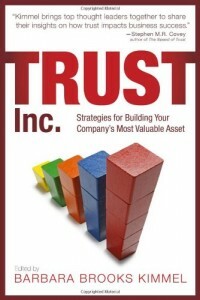 CHG: Let’s get into the meaty stuff of trust at the business level. Assuming you agree there’s been a decline in trust in business and our institutions—why is that? What’s the root cause? JP: History includes cycles of boom-and-bust, which I believe are inevitable, in part because incentives and inducements get out of line with responsibility and accountability. The disconnections of the last three years resemble the savings-and-loan debacle of the 1980’s. So for better or worse, we’re coming through one of those cycles. The cleansing process of the bust-and-recovery part of a cycle can include renewed attention to virtuous conduct – unfortunately, that tends to become diluted by less noble motives on the other side of the cycle. CHG: Well, let’s cycle through some of the possible solutions to that pervasive loss of trust. I’ve suggested that the business schools share some responsibility, and are part of a necessary solution. What concerns do you have about the effectiveness of teaching about trust, ethics and governance in the business schools and universities? JP: It’s my belief that much of the teaching is at best ineffective and at worst a misleading waste of time – although I am sensitive to the way this is received among my colleagues in academia. Jeff Skilling and Andy Fastow were celebrated as executives to be admired, and either one would have scored an A+ on any university-level course in ethics or governance. My experience with 35 years of exposure to world-class corporate frauds and irregularities is that the mid-level personnel and the gate-keepers who are caught up in serious wrong-doing almost all got there through a steady and fully-rationalized bending of what were initially a perfectly fine set of ethical values. The kinds of issues that students and newly-minted employees can comprehend, while real (plagiarism, personal over-reaching, etc. ), are over-taken in the work-place by subtle but compelling pressures to perform that leave their school experiences far behind. CHG: Let me push back on you a bit on that one. I’ll bet you’re right that Skilling could have passed any b-school ethics test—and you’re right that Skilling was vetted not only by Harvard Business School, but by McKinsey. But Tom Peters, who knew Skilling at McKinsey, states flatly that the “smartest guy in the room” almost certainly knew his shades of gray, and consciously did what he did. That doesn’t square with the idea of a gradual erosion of “perfectly fine ethics.” If he’d encountered courses that dealt directly with ethical issues, might they not have surfaced earlier? More generally: shouldn’t MBA programs shoulder part of the blame? JP: No academic program will affect a personality type that is bent from an early age, and Skilling and Fastow may be the exceptions that test my proposition. But – agreeing that the schools have a role and a responsibility – the issue I have with courses that “deal directly with ethical issues” is that they are labeled and telegraph their messages so transparently that they are easily gamed by those inclined to felonious intent. I would challenge the schools to do a more sophisticated job of embedding their ethical training into their mainstream curricula, where the learning opportunities are more nuanced and subtle – and thus better matched to the challenges that real life will bring. CHG: I couldn’t agree more. Real ethics training ought to be part of the strategy classroom, not a separate curriculum down the hall, where it’s inevitably going to be demeaned and diminished. Any other advice? JP: Having been around a lot of world-class white-collar criminals,many of whom showed signs of bad behavior at early ages, I consistently advise my clients to avoid the risk of dealing with a repeat offender. The rate of recidivism in corporate malfeasance is too high to make it worth the exposure of falling for a pitch of post-offense repentance. CHG: So much for redemption! What is your view of the causal relationship between corporate governance codes and the demonstration of ethical or trustworthy behavior? JP: The focus of my experience has been with the kinds of large-scale malefactions that can threaten the existence of a company – Enron or Arthur Andersen or Fannie Mae or Satyam. These are gestated and erupt at a level that transcends the effectiveness of risk management structures and codes of governance and behavior. Rather, they either occur – or do not – because of the underlying issues with and commitment of senior management to create and enforce cultures of success and of good practice. “Doing well by doing good” is a reality, in other words. But the latter does not drive the former – instead it is an observable consequence, flowing from the same source. CHG: So, both “good” and “well” are byproducts of a cultural devotion to doing business from a certain set of principles? Care to say something about what those principles look like? CHG: That’s not unlike the “are you OK with it on the front page of the NY Times” rule. A willingness to submit to commonsense and common wisdom, rather than to pin one’s hopes on precisely delineated behavioral codes. Let’s switch to government’s role. What can we reasonably expect from government by way of contribution to good corporate behavior? JP: I’m a deep skeptic on the ability of regulators to either detect or to deter bad behavior. Not that oversight and enforcement are not necessary. But it seems to me pretty clear that the post-Enron imposition of Sarbanes/Oxley did not lead to an outbreak of virtue. Look at the many examples over the last three years, including the investor frauds (Madoff, Stanford and many others) and the civil and criminal claims arising out of the credit crisis – many of them still working their way through the courts — including New Century, Lehman Brothers, Goldman Sachs’s Abacus product, the recent Wells notice sent by the SEC to Moody’s, etc. Law enforcement is by nature always going to be reactive, behind the curve of the inevitable misbehavior of those who would burst the limits. So although I have gotten in trouble for saying so around groups of investors, it is neither cynical nor unduly libertarian to say that investors and others in the public need to take their own responsibility to heart, and calibrate the extent of reliance they can reasonably place on their watchdogs. It goes back in part to why societies evolve their laws and codes of behavior. People don’t become law-abiding because more laws are passed – indeed, more lawmaking often reflects a social perception that behavioral norms have broken down and require the imposition of sanctions on violators. Rather, a society decides what limits and conventions it will accept, and its tolerance for the thresholds of deviance from those norms. And (as I remember in the 1970’s), the de facto legalization by the population of New York City of amateur marijuana use in Central Park. All of which goes in part to say that the level of achievable behavioral virtue involves a complex set of factors including trade-offs of costs and benefits and an understanding of the culture’s real system of incentives and deterrents. CHG: You said a mouthful there. And that’s great, in terms of understanding. Then again, where does that leave us vis a vis action? Where would you suggest an informed manager should focus his or her efforts? A journalist? A lawyer? An investor? A tax-paying, voting, citizen? Journalists – Well, it’s hard to watch the degradation in quality from deepening partisanship and races for ratings. There is still a market for quality reporting and quality commentary, though, and it is exciting to think how these will be delivered through rapidly evolving channels. CHG: Jim, this has been a pleasure. Thanks so much for contributing to the dialogue here on the Trust Quotes series. This is number 11 in the Trust Quotes series.